Mahi Mahi (Dolphin fish): Many people’s jaws drop when we tell them we are fishing for dolphin. But remember, we are talking about the fish, not flipper. The mahi is one of the most sought after sport fish in the tropics, both for the fight and the table fare. Once the fish is hooked they almost immediately go airborne. Their acrobatics are matched only by the sheer beauty of the neon blue, green and yellow colors that adorn the fish. 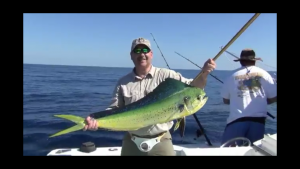 Mahi Mahi- Dolphin Fishing Tips: Probably the most popular method of targeting dolphin is trolling. Ballyhoo, strip baits and lures combined with the two are trolled behind the boat until the fish come in and strike. Once hooked they jump, trying to throw the hook from their mouth. In addition to jumping, they make long runs and fight hard all the way to the boat. Once gaffed, they are deposited directly into the fish box. If the fish lands on the deck of the boat, they can wreak a ton of havoc before being subdued. Mahi-Mahi make excellent table fare and can be cooked just about any way imaginable.